Even though bathrooms are typically designed with adults in mind, there are plenty of children's bathroom ideas to make the space more accommodating to youngsters. The key things to remember when designing children's bathrooms are safety, accessibility, storage, and having a little fun. When planning a children's bathroom, it's important to think about their unique needs so that they can be more independent and cause less stress on parents. Making the lavatory safe and accessible for little arms and hands will go a long way towards achieving this goal. User-friendliness and safety are first on the list of children's bathroom ideas. Universal design elements will make the room useful for all ages and abilities. Some ideas for incorporating universal design into a bathroom include lower countertop heights and single-lever or hands-free faucets. Also, look for a non-slip bathtub finish or add self-adhesive non-slip mats or decals for a safer bathing experience. A bath mat or rug which catches water outside the tub is another simple safety precaution. To help make the bathtub even safer, consider drain or faucet covers that let water pass through but prevent bangs and scalding. Storage is another item that is foremost in a child's lavatory. Plenty of cabinets and shelves will increase storage capacity for toiletries, towels, and other kid items. You can use baskets or bins on open shelves for handy storage and a cleaner look. The flow of towels and laundry can be kept under control with a tiered towel rack and a hamper right in the bathroom. A hanging bathtub organizer can hold tub supplies and bath toys without sacrificing shelf or cabinet space. Making children more self-sufficient in their bathroom will make everyone's life easier. Think about investing in an automatic motion sensor that turns on the light when a child enters the bathroom and then turns it off when they leave. Also, installing nightlights will help keep kids from tripping or bumping into something until the light switch can be reached. A child-friendly toilet seat will make unsupervised restroom trips a reality. 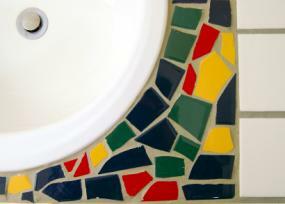 Choosing a soft-close or slow-close toilet lid will deter any slamming of the seat. Adding a sturdy stepstool or small wooden box to the lavatory will allow kids to reach the sink without help when it's time to brush those pearly whites. Shampoo and conditioner dispensers mounted at their level in the tub area will make washing up a cinch and conserve supplies. When two or more children share a bathroom, there are some special considerations to mull over. If possible, install a long countertop with double sinks for quicker access. If space allows, then separate areas can be created for each child so that there are less squabbles in the bathroom. These split vanity areas will also allow for slight décor differences based on each child's favorite color or theme. Pottery Barn Kids offers hampers and towels which can be personalized with each child's name for happier youngsters and less clutter on the bathroom floor. If towels are left out, there will be no guessing as to whose it is. Monogrammed bathrobes for each child are another great idea, so they can quickly cover up in shared lavatory scenarios. Now that the functional parts of the room are covered, you can move on to more enjoyable children's bathroom ideas. Picking out the color scheme and décor is the time to have some serious fun and look through bathroom decorating pictures for inspiration. One tactic is to keep the walls rather neutral such as a soft tan or yellow, and then add color and interest with accessories, hardware, towels, fabrics, or artwork. Bring several pre-approved options home for your child to think about, so that they feel more involved in the design process. Go for a sophisticated twist on children's bathroom design and avoid going too whimsical. This will give the décor more longevity as the child grows and matures. For example, help your child decide on a favorite color and then go with a grown-up version of that hue. If a bold or daring color is still desired, then it can always be brought in with accessories. Consider using a fun, bright color of laminate for countertops to add some pizzazz, since this inexpensive material can be changed out in a few years. Fairy tale - princess, castles, fairies, anything pink!